This is a copy of an article I wrote for the 2016 March/April issue of Lawn & Garden Tractor magazine. The original article contained images of the original Wild West Show from the Wisconsin Historical Society. Since I don’t have permission to use those images here, you’ll have to read the original article to see them. I will put links to some images contained on the Wisconsin Historical Society website. In 1966 International Harvester introduced the fist hydrostatic driven garden tractor. The Model 123 hydrostatic drive garden tractor appeared almost identical to the Model 122. Both models were powered by a 12 hp, Kohler K301 engine. Cosmetically the only difference was the hydrostatic control lever on the dash of the 123 instead of the gear shift lever on the 122. IH did a complete redesign of the 122 rear end eliminating the geared transmission and replacing it with a Sundstrand 15U hydrostat. As in previous Cub Cadets, the engine was installed with the PTO end toward the front of the tractor. As in all other Cub Cadets of that period, there was no belt in the drive line. A solid drive shaft ran from the flywheel side of the engine to the rear of the tractor to drive the hydrostat. Instead of the three forward and one reverse speeds of the 122, the 123 allowed infinitely variable speeds in the forward and reverse directions by simply moving the control lever. There was no need for a clutch and the brake was only used for parking. When IH introduced the Model 123, they knew buyers, especially farmers, would be skeptical. Farmers trusted the simplicity and reliability of the gear drive transmissions they had used for years. To prove the ruggedness of these new transmissions, IH developed a “wild animal act” to show off their new tractors. IH painted three Model 123’s as “wild animals”; two tigers and a leopard. They hired a professional actor, George Mann, as ringmaster, and along with IH salesmen, performed at state fairs throughout the Midwest. Mann played the part of “Fisbee” a hapless animal trainer. During the act the “animals” would do wheelies, jumps, make high speed turns, race towards each other at high speeds, and suddenly reverse direction using only the control lever to demonstrate the ease of use, reliability and ruggedness of these new machines. The jumps would propel the tractors completely off the ground. The sharp curves would result in the inside wheels leaving the ground by as much as 8 inches. The tractors would maneuver within inches of each other at high speeds. And all these maneuvers were performed without the use of a clutch or brake. All the control was preformed using the simple control lever. For entertainment value, at one point in the show the ringmaster would loose complete control of the animals and they would run wild about the show ring often pinning the ring master against the side of the ring. The act was not performed without incident. George Mann would often spend time between acts nursing an injury. The speed reversals were performed over 50 times per act and there were over 100 acts during the summer and autumn. The hydrostatic transmission was subjected to the wear and tear that would take a homeowner years to accumulate and they held up. In addition to state fairs, the wild animal act performed at the Farm Progress Show at Farmer City, Illinois before a daily attendance that was estimated to be over 6,000. At the conclusion of each wild animal act, Fisbee (George Mann) would use a standard Model 123 (no stripes or spots) to demonstrate all the features of this new tractor. He demonstrated the ease of operation as well as how the control lever would return to the neutral position when the brake was applied for emergency stopping. The wild animal act was part of the IH Exhibit that won the Governor’s Cup at the Iowa State Fair. By all accounts the act was very successful in introducing this new line of tractors. When my wife first saw a replica of one of the Tiger Cub Cadets several years ago (she tells me it was over 10 years) she immediately fell in love with the look and wanted one to be “her” tractor. (As a side note, this replica was built by Roger Kitterman, a good friend who has since passed.) 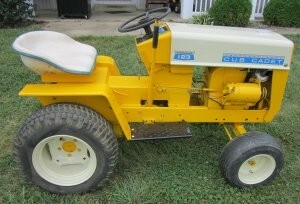 Since my wife has been very supportive of my Cub Cadet addiction, I felt she deserved her own Cub Cadet. About 4 years ago I located and purchased a Model 123 for the project. It needed a new dash and hood, but otherwise was in great shape. The engine smoked but that would be an easy fix. Unfortunately it wasn’t high on my priority list, but during the winter of 2014 I overhauled the engine and during the summer of 2015 I started the build. 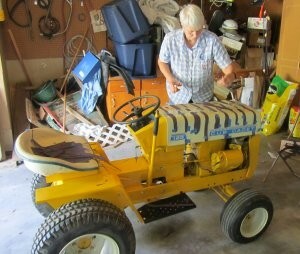 The tractor was completely disassembled, cleaned and painted. Once the painting was completed, it became my wife’s project. She applied black vinyl to simulate the tiger stripes. Although it was impossible to duplicate the actual shapes of the stripes on the original Tiger because of the limited pictures we had available at that time, she did try to duplicate the number of strips in each section wherever possible. She worked with HAPCO to duplicate the face as closely as possible. 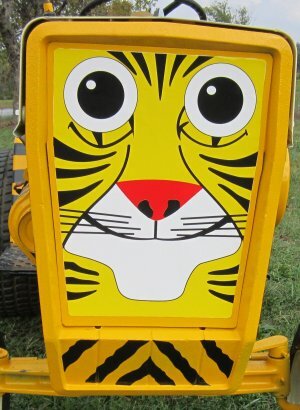 In the original Tiger, IH used the headlights for the eyes and worked those into the face. We decided to produce the entire face using one large decal rather than installing headlights. The goal was to complete the Tiger in time for a local show the second weekend of October. My wife completed applying the last stripes the day before we took our tractors to the show, and we completed the tail in the morning before transporting the tractor to the show in the afternoon. It was there for the start of the show on Friday, and my wife drove it in the parade on Saturday. I’m sure it will show up at several shows next summer. And who knows, her having her own tractor may be the path to more tractors and accessories for me. I would like to thank the McCormick-International Harvester collection, of the Wisconsin Historical Society for providing me with much of the historical information contained in this article (www.wisconsinhistory.org/mccormick). I also want to thank the Wisconsin Historical Society for providing and granting permission for the use of the historical photos.